Recently I came across a site that sells automated netting systems for blueberries, grapes and cherry trees, and a new product that they call the Eagle. The company can be found on the internet and is called Spec Trellising. Their product, the Eagle is an ingenious bird-scare device that takes flight to scare away hungry birds. Launched into flight by the wind, the Birdscarer flaps its wings as it darts around the sky, adding both movement and a "swooshing" noise to scare away hungry birds. As the wind eases off, a counterweight retracts the line back into the pole, leaving the Birdscarer perched atop it’s pole, eagerly awaiting the next gust of wind. 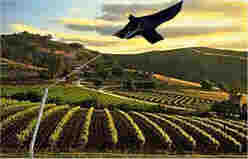 The Birdscarer is a large black bird shaped kite with a 5' 6" wingspan and 3' 4"in height. It is expertly made for maximum durability and longevity with high quality materials such as nylon Oxford cloth and sparred with a solid fiberglass frame. Reinforcements and connectors are of strong vinyl and seat belt webbing. 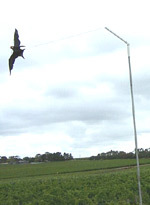 Critical to the operation of the Birdscarer is the unique retractable line system. The 45 degree angled PVC top section encloses a 11'6" line which launches the Birdscarer into the wind, The Birdscarer sits upon a 20' steel pole scaring birds by it’s very presence, shape and color. One Bird Scarer is recommended per 2.5 acres. Why isn't British Columbia's Ministry of Agriculture and the BC Blueberry Council evaluating the many variations of silent bird scare devices on the market, instead of stubbornly condoning the use of noise polluting devices that are driving people crazy! Propane Cannons are Weapons of Mass Distraction!